In my novel, my main character has come from earth to a fantasy world. She has been reborn on an island of giants (10-meter tall humanoids) where everything is scaled up to match what they would look like to a normal size person. My question is what could my main character look for to tell that she is, in fact, a giant when compared to a normal person in a world that is scaled up to match her size? I mean that the trees and rocks and everything around her is scaled up, not just the artificial structures. What physical effects could she notice? There are no normal sized people in this area until much later on as the area that she starts in is completely separated from the outside world. What may make it clearer is if you imagine that the world is a 10x scale replica of our world and you are viewing it from an outside perspective, what effects could you observe that would give you an idea of the scale of the world that you were in? What you're looking for is largely the opposite of what we saw for the 1mm tall robots. Surface tension of water is a noticeable thing, there's a clear bulge that would seem smaller than memory suggests it should on any given surface. Of course we're not looking at such a pronounced effect in this case, but it would be significantly reduced. Gravity would have interesting effects, jumping or falling body height would have a considerably greater impact than expected. The square cube law would make things like sudden changes of direction inexplicably harder. Assuming it's the same world, your biggest giveaway could be the distance to the horizon. A 6 foot tall person would see a 3 mile horizon, a 10 foot tall person would see a 4 mile horizon. At 10m (32ft) tall they're looking at a horizon distance around 7miles (11km). This is a non-linear relationship, the taller you get, the closer your horizon appears to be. The world seems ever smaller. Gravity - Time of fall. Assuming they live in the same gravitational field as the non-giants then simply drop something and see how long it takes to hit the ground. A $10m$ fall would take about $1.4$ seconds. Edit : From discussion in comments, I'll add some explanations. Even without having previously e.g. dropped things and measured the time to fall you would notice this difference. It would be like watching things fall in slow motion - very obvious to anyone in an instant that something is off. It might take you a little effort to work out exactly what is causing the "slow-motion" effect you see, but you would get to the fact that you're bigger than you used to be. This effect would be less noticeable if you were not quite so tall. For example the fall from $4m$ (still twice normal human height) would only be $1.4$ times longer (a change from $0.6 s$ to $0.84s$) and you might not notice that before you mentally adapted to the new environment. But the $10m$ tall human would find the change really big and much harder to "adapt away" or dismiss mentally. Note that this would also be jarring because your horizontal speed of movement would not seem to change, while time of fall did. Your gait and walking speed might seem more like normal when you scale up size, but you cannot fool gravity, so you'll have a permanent inconsistency between the apparently normal horizontal walking speed and vertical motion. This would be hard to ignore. I'm assuming the new giant is made out of materials and mechanics that can support the weight and don't cause problems with the person itself. Otherwise her bones would break more easily (not guaranteed, depends on how much of a giant she is) and she would overheat like crazy (less surface area to lose heat compared to the volume that generates heat). Liquids have less cohesion. Think of a droplet of water on a leaf, you won't see that kind of thing when you are big as the water would pool more. Blood loss will also be much worse, as you'll lose a lot more and the flow rate will be higher, making it harder for the blood to clot and seal the wound. My plan is to basically use magic for a localised weight reduction on the giants themselves. They are still physically as dense as they would be but weigh less. The world around them will still have normal gravity. Will their physical strength be scaled to their inertial mass or their weight? Because you've now made those different (by a factor of ~5 for 2m -> 10m height), to overcome the square-cube effect!! If their strength matches their weight, so it's about equally strenuous to stand up, or do yoga / plank / push-ups, then they'll find it much harder to pick up objects of the same apparent size. And they'll find it very hard to get up to speed / change direction when running, with 5x the momentum they're used to relative to their strength. If they start to notice a discrepancy and try to investigate, they might use a rough balance (like a fallen log) to find something of their own weight. Because their gravitational weight is ~5x less than it should be for their volume. Depending on how realistic you want it, and how faithfully everything is scaled up, she'd probably find out by the numerous health problems she'll encounter pretty quickly. Undersized heart and undersized joints and bones in the legs for instance. This would be shared by pretty much all living things (trees scaled up beyond the limits of their current biology would either fall or die off at the top). If we're assuming that things have been scaled up disproportionately to allow for these things not to be a problem, she'd probably notice her legs are proportionately bigger as a start. People are pretty intimately aware of their own bodies' proportions, so changes will be obvious. The next most obvious thing might be mass. Bigger things take disproportionately longer to accelerate and decelerate due to the square-cube law causing weight to increase at a greater rate than size. Anything she manipulates will feel disproportionately heavier (even accounting for her added musculature). Whatsmore, falls would hurt, so if she tripped and fell she'd be able to work out something was off. Provided she's young and healthy it's not normal to be thoroughly bruised all over from a simple fall. Green flashes and green rays are meteorological optical phenomena that sometimes occur just after sunset or right before sunrise. When the conditions are right, a distinct green spot is briefly visible above the upper rim of the Sun's disk; the green appearance usually lasts for no more than a second or two. Rarely, the green flash can resemble a green ray shooting up from the sunset (or sunrise) point. The green flash is seen at the horizon during sunset/sunrise. And we know that the distance between the observer and the horizon depends on the elevation of the observer above the sea level. In principle, if one is laying flat on the ground when observing the green flash, by rapidly standing up another green flash can be observed, because by standing up the horizon has moved slightly farther. This is already cool because one can see 2 green flashes close to each other. However..
For a normal human the height change will be about 2 meters at best, while for a giant it will be 10 meters: this will have a measurable effect on the time separation between the two green flashes, which will have a larger separation than the one measured by a normal human. By comparing the two time intervals your character can conclude that her body has increased in height. 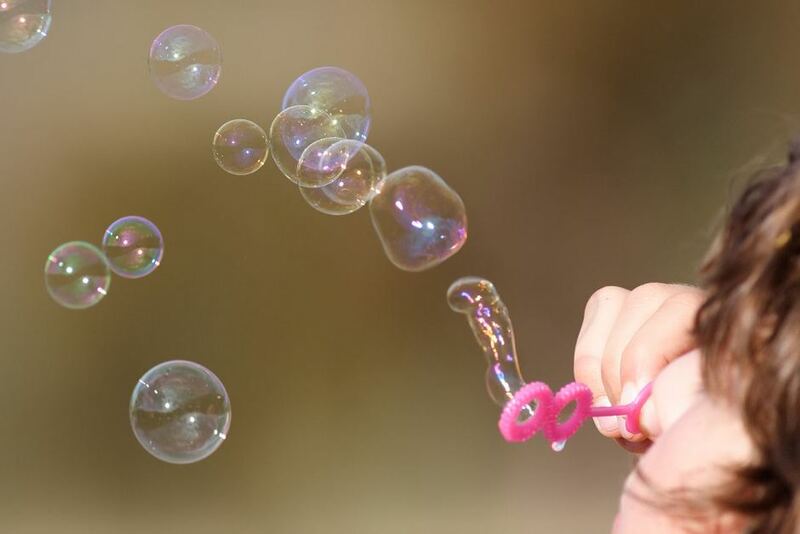 Small soap bubbles behave differently than large soap bubbles. Small soap bubbles start out as blobs but quickly form a well-rounded sphere. They then float around with a stable "tight" outer surface. This is because of a molecular property of the soap. Unless you scale up the actual soap molecules, this effect will remain. So if your protagonist tries to blow a spherical soap bubble on a whim, it will not look or behave the way they expect, because what they think is a small bubble is actually a giant one. It takes time to send commands and receive sensory feedback along the length of a nerve. Having longer limbs, your character may experience a delay between asking a finger to move and then seeing and feeling it move. Just enough to feel slightly inebriated. They could acclimate to this sensation eventually. If giant humans are proportionally stronger, and all health & movement issues are handwaved away, there is still a number of things that would give the scale away. Water tension (already mentioned in the other answers). If water tension remains a constant, it would look very different for 10-meter tall persons. Invasive/migratory species. Are only the "giant" versions of animals allowed on the island? Any normal sized seagull or dolphin would become a surprise. Your giant will see what looks like silt sized particles behaving like sand. Sand particles can't get below a certain size and still behave the same way. If sand is worn down to a powder like consistency it becomes silt which behaves in different ways, (when wet it can't reflect enough light to look white for instance) if it is worn even more water will chemically alter it into clay. Thus white beach sand particles never get below a certain size. More importantly to have sand dunes you need, well sand, silt will not form dunes. the closest it can get is loess hills which do not happen in wet environments. If your character goes to the beach they will notice the white dune sand looks like powder which can't happen. It is pretty big leap to "I'm a giant" but it could certainly give hem their first clue, and it would be concrete evidence not just a feeling. If they know a little geology it will be a very glaring issue. If they can get a hold of a strong magnifying glass or low powered microscope they can confirm it is shelly beach sand (made largely out of shell fragments) and thus cant be silt. Finding a bay with normal silt in it will help confirm as well. Sand also behaves differently than silt, a footprint in dry silt will not fill itself back in the way sand will. The can further confirm with a simple soil testing trick using a jar. if you mix sand and silt with lots of water and then swirl it around the silt will stay suspended in the water a long time but the sand will fall out. Scale will not effect this. I assume that if everything scales up x10, then so do the units of measurement. So 1 meter in the new world would be equivalent to 10 meters in this world. Clearly measuring herself would be useless. Whether the speed of light can be measured depends on their technology, I guess. But in our world it was measured as early as 1676 by Danish astronomer Ole Rømer. Basically, he noticed that Jupiter's moon Io took longer to finish its orbit in periods when Earth was moving away from Jupiter in its own orbit around the sun, than when Earth was moving towards Jupiter. Because we also roughly knew the distance from the sun (which was known earlier), the relative angle of Earth's orbit with respect to our separation from Jupiter, and (obviously) the orbital period of Earth around the sun, we know the speed of Earth with respect to Jupiter. Given this and the delay in Io's orbit, it's quite easy to calculate the speed of light. At 10 meters, the ambient temperature differential between your head and your feet would be far more noticeable. Outside, you'd notice that it seems really cold when you're standing up and much warmer when you're sitting on the ground or lying down. Indoors, you might detect the opposite, as heat tends to rise and get trapped at the ceiling. Either way, you'd definitely notice a distinct difference in temperature between standing and sitting heights. You might even notice that the atmosphere is thinner up there, resulting in your breath being shorter when standing than while sitting. If all the limbs are bigger, then the heart will beat more slowly : it will need more energy to push all the blood necessary and the heartbeat will slow down to 20 to 30 bpm (20 is the whale, 30 the elephant). The character could make an effort that'll left him/her exhausted, and sense his pulse at a horrendous slow rate in his head. Maybe a good way to tell if you're a giant is gravity. If the gravity in this world is the same from earth, she'll notice that she's heavier and that something doesn't seem quite right. Also, you can put on some normal sized animals, or giant sized animals, but not as big to scale to the Giants, so she'll see familiar animals but smaller and start questioning things. Simple, just jump up and down. Creating a crater when you jump is not normal, it would certainly make the character realize that something is wrong. Is this a trick question? Her weight will be 10X, if she had a weighing scales , she will suddenly be 10 times heavier! Steven Martin is a new contributor to this site. Take care in asking for clarification, commenting, and answering. Check out our Code of Conduct. Not the answer you're looking for? Browse other questions tagged physics fantasy-races scaling or ask your own question. How would I know if I were a 1 mm tall robot? How can fae rescue one of their number from an iron cage? What can a great animal (Hyppogriff, Gryphon, etc.) learn from an elf? How does one explain transformation magic? How to protect a tail while wearing armor?